COBBLE HILL — When Anne Mourier was looking to host her first solo art show, she wanted a small, intimate space that would suit her small-scale work. 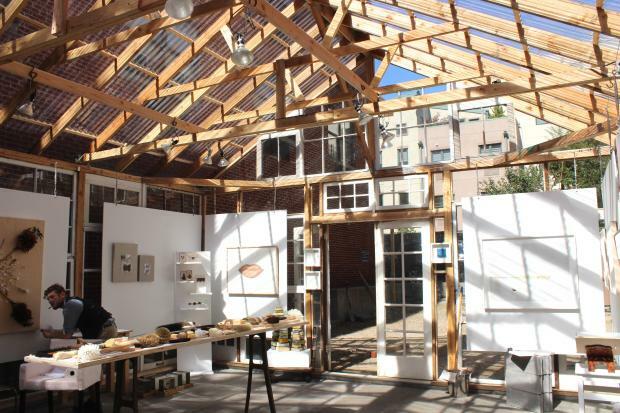 The Glass House, a brand new exhibition space at the Invisible Dog Art Center on Bergen Street, was designed and built to answer Mourier’s dilemma. As an artist-in-residence at the Cobble Hill gallery, she knew her pieces, mainly miniatures, photographs and small objects, would be lost in the Invisible Dog’s main gallery, a vast room with high ceilings. But at the Glass House — a smaller space constructed over the summer for less than $5,000 using mostly recycled and reclaimed wood — Mourier's work can shine. The Glass House “gives the miniatures a louder voice,” said Aaron Freedman, an artist-in-residence at Invisible Dog. The theme of Mourier's show is domestic life, and it consists of miniatures, such as tiny broomsticks and sculptures made of dust, arranged around the home-like structure, Mourier said. The show, titled “Cleaning It Up,” is inspired by Mourier's childhood memories of her family’s "obsession" with cleaning, she said. “There is definitely a very strong relationship with the space and [Mourier's] work,” said Lucien Zayan, owner of the Invisible Dog. Zayan hopes to use the space to promote more women artists at the Invisible Dog, which has usually hosted male artists in the past, he said. “Try to imagine Anne’s work here,” said Zayan, as he looked around the Invisible Dog’s massive exhibition space and shook his head. The Invisible Dog Art Center is hosting three exhibitions this fall, including “Cleaning It Up,” from Sept. 7 to Nov. 9. For more information, visit this website.